A k-limited automaton is a linear bounded automaton that may rewrite each tape square only in the first k visits, where \(k\ge 0\) is a fixed constant. It is known that these automata accept context-free languages only. 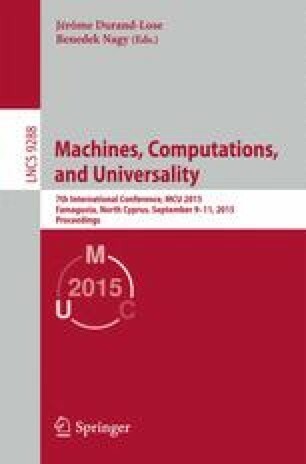 We investigate deterministic k-limited automata towards their ability to perform reversible computations, that is, computations in which every configuration has at most one predecessor. A first result is that, for all \(k\ge 0\), sweeping k-limited automata accept regular languages only. In contrast to reversible finite automata, all regular languages are accepted by sweeping 0-limited automata. Then we study the computational power gained in the number k of possible rewrite operations. It is shown that the reversible 2-limited automata accept regular languages only and, thus, are strictly weaker than general 2-limited automata. Furthermore, a proper inclusion between reversible 3-limited and 4-limited automata languages is obtained. The next levels of the hierarchy are separated between every k and \(k+3\) rewrite operations. Finally, it turns out that all k-limited automata accept Church-Rosser languages only, that is, the intersection between context-free and Church-Rosser languages contains an infinite hierarchy of language families beyond the deterministic context-free languages.